February 8, 2016 - A British helicopter Pilot working for the Friedkin Conservation Fund was killed while assisting Tanzania authorities with tracking down an elephant poaching ring in Tanzania. 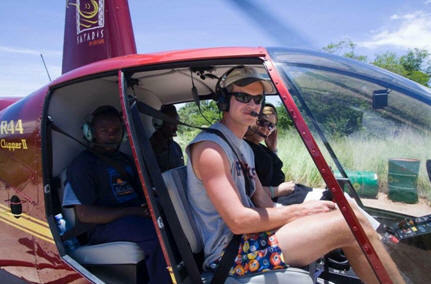 On January 28, Friedkin Conservation Fund helicopter pilot, Roger Gower 37, was killed while piloting a helicopter over Maswa Game Reserve. Gower was working with authorities on an anti­poaching flight when he was killed. Gower had been working with wild game life authorities in an effort to track down elephant poachers when his helicopter was fired on by poachers, he was fatally wounded. Within days of Gower's death, Tanzanian law enforcement has arrested five elephant poachers including a man who is suspected of being directly responsible for Gower's death. The other four men have been arrested for being involved in a criminal network providing illegal firearms and facilitating the transport and sale of ivory. Dan Friedkin, Chairman of Friedkin Conservation Fund said, "This extensive operation has also uncovered a wider network of suspects involved in poaching and the illegal ivory trade, which is expected to lead to further arrests. "We are confident that the Tanzanian authorities will investigate and prosecute those involved to the absolute full extent of the law. By bringing these individuals to justice, it will honor Roger’s memory. We also fervently hope that it will mark the turning point in Tanzania in the fight to protect elephants and our wildlife heritage."